"This show is not going to save your theater!" Universal has debuted a new full-length 3-minute trailer for Illumination's new animated movie titled Sing, starring Matthew McConaughey as a Koala who decides to host a singing competition. This is obviously inspired by "American Idol" and all the numerous singing competitions around the world. It also seems to be a bit like Zootopia set in a diverse world of animals, with a story where some of them are going to break the mold of what's expected of their specific species. 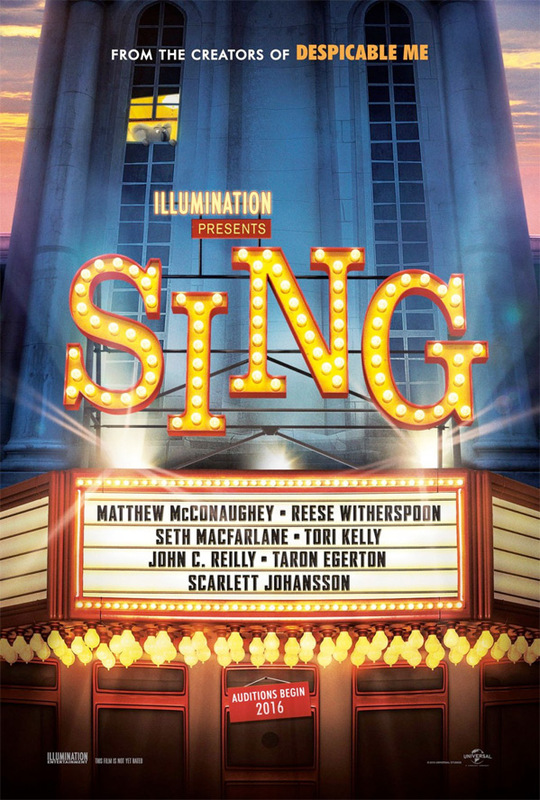 The cast includes Reese Witherspoon, Seth MacFarlane, Scarlett Johansson, John C. Reilly, Taron Egerton and Tori Kelly. It's a "musical comedy about finding the shining star that lives inside all of us." Sing apparently features more than 85 hit songs, a few of which can be heard in this trailer below. Have fun! Set in a world like ours but entirely inhabited by animals, Sing stars Buster Moon (McConaughey), a dapper Koala who presides over a once-grand theater that has fallen on hard times. Buster is an eternal optimist—okay, maybe a bit of a scoundrel—who loves his theater above all and will do anything to preserve it. Now facing the crumbling of his life’s ambition, he has one final chance to restore his fading jewel to its former glory by producing the world's greatest singing competition. Five lead contestants emerge: A mouse (MacFarlane) who croons as smoothly as he cons, a timid teenage elephant (Kelly) with an enormous case of stage fright, an overtaxed mother (Witherspoon) run ragged tending a litter of 25 piglets, a young gangster gorilla (Egerton) looking to break free of his family's felonies, and a punk-rock porcupine (Johansson) struggling to shed her arrogant boyfriend and go solo. Each animal arrives under Buster's marquee believing that this is their shot to change the course of their life. Sing is both written and directed by filmmaker Garth Jennings (director of Son of Rambow, The Hitchhiker's Guide to the Galaxy previously). Universal will release the film everywhere in theaters starting December 21st later this year. Talent shows are the only way to make it now. 🙂 The kids will love it. I am gonna love that movie. It looks like they captured the magic of AMERICAN IDOL in this movie! Good on Illumination.